How far along? 28 Weeks- We've officially entered the third and final trimester!! Crazy!! 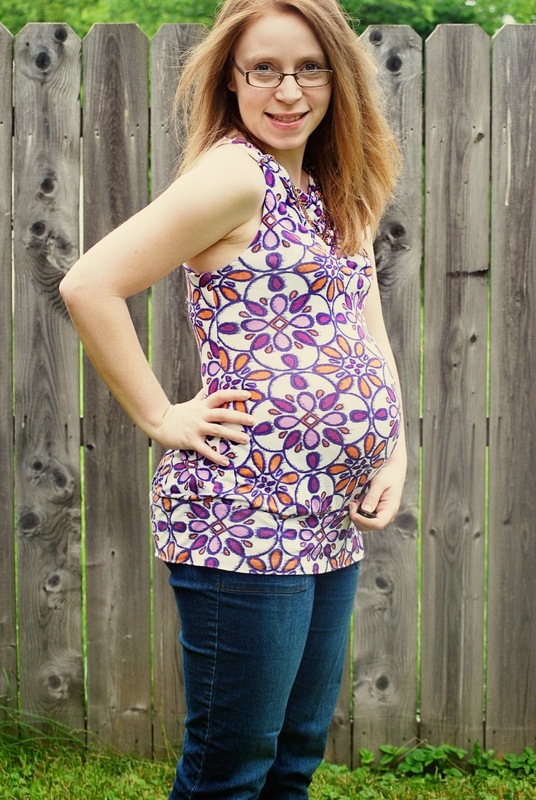 Maternity clothes: Mostly maternity, or loose fitting non maternity. I feel like our baby girl has grown a lot this week...but maybe it's just me!!! Best moment this week: Hmm, it's been a rather slow week, so nothing of real importance comes to mind...baby related anyway!! In non baby news, Shaun's last day of school was the best...I love having my little man home with me!! Miss anything? Sleeping on my stomach...and well, sleeping in general. Being able to get things done. And as much as I actually do really love my maternity wardrobe, I do at times miss being able to wear whatever I want!! And having more clothing choices!! Picking up my little man and being able to snuggle him more comfortably. Movement: Lots...and becoming more and more visible...which is crazy since it was already pretty visible to begin with...I can't help but wonder if others have taken any notice while out and about!! Food cravings: Fried Pickles. Rally's Ice Cream. (But not together!) Water, water, water! Food aversions: Same- Drinks- I still cannot drink anything but water or Starbucks (decaf) frappucinos. No real food aversions though. Labor signs: Still having more contractions, and becoming more painful at times too. As of my appointment last week though, doctor wasn't too concerned...still loading up on water and getting as much rest as possible. Sleep: Sleeps, what's that!? Finding it harder and harder to get comfortable at night. Symptoms: Pain, pain...everywhere!! Hands and feet still swelling. Contractions. A little bit of heartburn at times. General exhaustion...it's most certainly the third trimester!!! Belly button in or out? It can't make up its mind. It was half out, then went back in...now it's kind of flattened...but really it just seems to vary depending on baby's position. You look so fresh :) Love your top. Awww! It seems like it's going so fast! Does it seem that way to you? Get your rest! You are adorable. Love that shirt!